A solid state sensor reacting to the condenser coil temperature modulates the condenser impeller between minimum and maximum speed based on the coil temperature. This reduces noise levels, fan cycling, compressor cycling and prevents the unit from freezing. This coating will withstand 1000 hours of salt spray per the ASTM B 117 test method. Also see Stainless Steel Shell or Integrity NEMA 4/4X Air Conditioners. NOTE: Severe operational environments such as waste water treatment and salt spray are likely to cause corrosion failure over a period of time regardless of coating. Warranty: Corrosive conditions may affect the warranty coverage. Consult factory for warranty limitations in corrosive environments. NOTE: For additional corrosion protection options, contact factory. 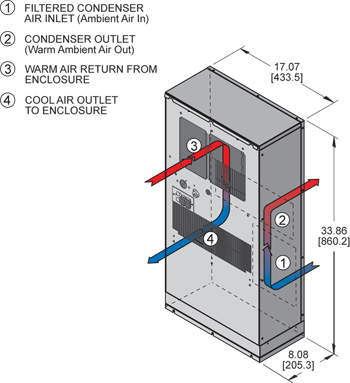 The Profile Series Air Conditioners have been engineered to be mounted either outside or inside of an enclosure, offering an unprecedented degree of flexibility. Air conditioners are traditionally mounted on the outside of an enclosure because space inside an enclosure is at a premium. The dimensions of the Profile Series make the option of internal mounting a reality, which allows the unit to fit into spaces previously too small for an air conditioner. 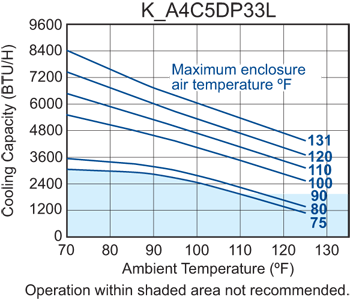 With such a narrow depth, the Profile Series is the thinnest line of indoor/outdoor air conditioners Kooltronic has ever developed. For DP33 models the filter part number is 11001F.